RM Auction’s 2015 Paris classic car sale will feature the 1939 Alfa Romeo 6C of Mussolini’s mistress, a 1963 Ferrari 250 GT Lusso and a 1964 Porsche 904. As RM Auction’s second Paris sale will be during the Rétromobile week in early February, it is appropriate that several of the cars on offer have a significant history. Of the ten cars having a pre-auction estimate exceeding a million dollar, for once, only two of these are Ferraris. 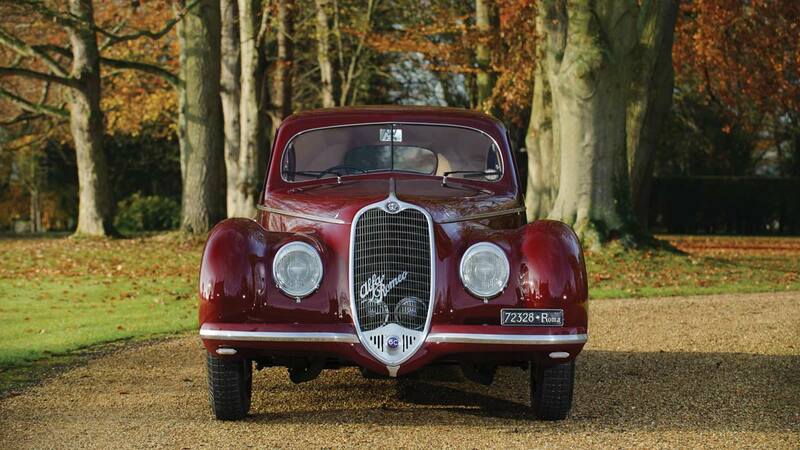 RM Auctions’ 2015 Paris sale will be headlined by the 1939 Alfa Romeo 6C 2500 Sport Berlinetta with bodywork by Touring that Italian dictator Benito Mussolini destined for the exclusive use of his mistress Claretta Petacci. It was in this car that she was stopped by partisans on the shores of Lake Como while trying to flee Italy at the end of the Second World War. Even without its historical importance, the Alfa Romeo 6C can be considered to be amongst the most desirable pre-war grand touring cars. This particular car has been fully restored and won ‘Best in Class’ at the Concorso d’Eleganza Villa d’Este in 2007 and ‘Best of Show’ at the 2011 Salon Privé Concours d’Elegance amongst others. (Estimate: €1.900.000-€2.400.000). Bonhams will also have three 1930s Alfa Romeos on offer in Paris with estimates exceeding a million dollar. Several Porsches will be on offer at the 2015 Paris classic car sale of RM Auctions. Three are expected to achieve over a million dollar each. A 1964 Porsche Type 904 with an extensive successful racing history is expected to achieve the highest result of any German car at the auction. However, two special 911s may attract even more interest: a 1969 Porsche 911 S Factory Rally that won the 1969 Acropolis Rally and a 1973 Porsche 911 Carrera RS 2.7 Sports Lightweight, one of only 500 built for homologation purposes. Three Lamborghini Countach LP 400s will be on offer at the 2015 Paris sale of RM Auctions. A rare 1977 right-hand drive Lamborghini Countach LP 400 ‘Periscopio’ is estimated to achieve €1.2 to €1.5 million. According to Max Girardo, Managing Director, RM Auctions Europe, there is a real surge in demand for supercars from the 1970s and 1980s. Posters of these cars have adorned the bedroom walls of teenagers, who are now affluent enough to realize their dreams. A 1980 LP400S (estimate €500-700,000) and a 1989 25th Anniverario will also be on offer. The Anniverario was supposed to have been produced in limited numbers but with 667 cars sold, was the most popular of the Countach series. This is reflected in the estimate of €250-300,000. The top French car on offer will be a 1935 Delahaye 135 S with a magnificent racing history. It competed at numerous events between 1935 but its greatest result was second place overall at the 1937 24 Heures du Mans. The Delahaye has an estimate of €1.2 to €1.6 million. No major classic car auction will be complete without expensive Ferraris. A 1963 Ferrari 250 GT/L Lusso is expecting to achieve the second highest result at the Paris auction while a 1990 Ferrari F40 is also expected to sell for more than a million dollar. The almost obligatory Mercedes Benz 300SL on offer here is a good one. It is a red 1963 roadster – a late model with top specification in an original and well-maintained condition. It is reflected in the estimate of €1.3 to €1.9 million. RM Auctions’ 2015 Paris auction will be held on February 4, 2015, at Place Vauban immediately after the Festival Automobile International, which features a display of concept cars during the annual Rétromobile week. Bonhams’ 2015 Les Grandes Marques du Monde au Grand Palais classic car sale in Paris will be a day later. However, the most watched auction in 2015 will be the Artcurial auction where the 1961 Ferrari 250 GT SWB California Spider from the Baillon Collection is expected to set an auction record for Paris.